One of the fundamental goals of the Ask Your Candidates! (AYC!) initiative is to ensure that medical progress takes its rightful place among the priorities candidates discuss as they vie for a seat in Congress. To further this and the central, voter education agenda of AYC!, we’ve launched an ad campaign on POLITICO.com. These ads, which will run through July 27th, have three different frames, each of which poses a question on the topic of medical progress: 1) What will candidates for Congress do to help kids who need cures? 2) What will candidates for Congress do to help the 30 million Americans with a rare disease? 3) What will candidates for Congress do to help families grow old together? These questions are examples and far from exhaustive. Why do you care about medical progress? Click here to let your candidates know and see if they care, too. 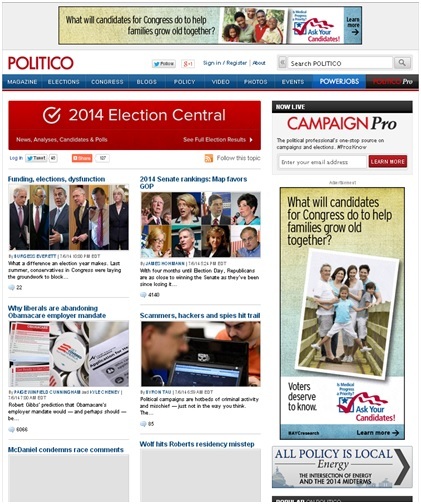 Check out the ads at http://www.politico.com/p/pages/2014-elections and other POLITICO web pages.